Scientists at the University of Reading have found how simple bacteria can restart their 'outboard motor' by hotwiring their own genes. Unable to move and facing starvation, the bacteria evolve a replacement flagellum - a rotating tail-like structure which acts like an outboard motor - by patching together a new genetic switch with borrowed parts. The findings, published in the journal Science, show that when an organism suffers a life-threatening mutation, it can rapidly rewire its genes. The remarkable speed with which old genes take on new tasks suggests that life has unexpected levels of genetic flexibility. The discovery was made by a team at the University of Reading, led by Dr Robert Jackson and Dr Louise Johnson. The Reading team, funded in part by BBSRC and the Leverhulme Trust, collaborated with scientists at the universities of York, Exeter, and Massachusetts Dartmouth. Dr Tiffany Taylor, University of Reading, joint lead author of the study, said: "Our findings in this study show how resilient life can be. "We thought we had broken the bacteria's ability to move beyond repair. In theory, the bacteria should have starved to death and effectively gone extinct. Yet over the course of a weekend they managed to patch themselves back together with borrowed genes." Scientists made the discovery by accident, while researching ways to use naturally occurring bacteria to improve the yield of crops. 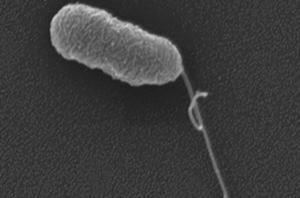 A microbe was engineered so that it could not make its ‘propeller-like' flagellum and forage for food. However, when a researcher accidentally left the immotile strain out on a lab bench, the team discovered the bacteria had evolved over just a few days. The new variety of bacteria had resurrected their flagella in the process. Remarkably, this happened because the mutants had rewired a cellular switch, which normally controls nitrogen levels in the cell, to activate the flagellum. This rescued these bacteria, which faced certain death if they didn't move to new food sources. The bacteria being studied, Pseudomonas fluorescens, are among a group of bacteria scientists are researching for use in agriculture, as a kind of ‘plant probiotic'. These could help crops grow or fight off diseases, leading to higher yields. However, a key problem is that the bacteria lack resilience, as their positive effects can stop working after only a short period of time. Dr Jackson, a microbiologist at Reading, said: "Plant probiotics could make crops grow more reliably in the future, helping to feed the world's growing population. This new study shows that these bacteria are more resilient than previously thought, as they show a remarkable capacity to overcome catastrophic changes and find a way to survive. "This gives us crucial insights into how bacteria could survive and change, and the challenge now is to see if this occurs in their natural soil and plant environment." Dr Johnson, an evolutionary biologist at Reading, said: "Evolution has been described as a process of ‘tinkering', but this work shows that evolution can be remarkably repeatable. When the situation is desperate, life finds a way." Dr Liam McGuffin, a University of Reading bioinformatician, built three-dimensional computer models of the proteins involved, which showed that the missing molecule and its new substitute were very similar. "The bacteria effectively finds a similar protein molecule to the one we knocked out and uses it for a different purpose," Dr Taylor said. "This molecule then gets used as a replacement ‘key' to ‘hotwire' its motor. "But the hotwiring comes at a cost. The replacement key is a molecule borrowed from a system which regulates nitrogen levels. The mutant bacteria can now move, but it can't regulate nitrogen properly, which can build up and become toxic. Of course, it's an evolutionary price worth paying when the alternative is certain death." This research will appear in the 27 February, 2015, issue of the journal Science, published by the AAAS, the science society, the world's largest general scientific organization. See http://www.sciencemag.org, and also http://www.aaas.org.